Daft Donkey Christmas Tree Ornaments Set of 8. Our Daft Donkey Tree Ornament begged to differ to be named Dapper Donkey instead. We admit; each of them looks pretty dapper but the name 'Daft Donkey' just rung more (jingle) bells. 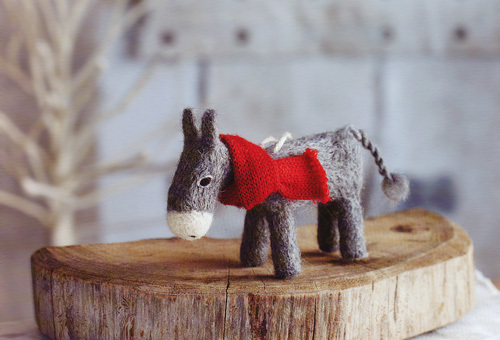 Each of our cute-as-a-button Donkey Ornaments features a bright red scarf, hand-stitched eyes and nostrils and a twisted felt tail. These soft and cheerful offerings provide appealing holiday texture on any tree. Each ornament hangs from a white cotton loop. These Daft and Dapper Donkeys are perfect for display on our pictured White Felt Forest Trees (sold separately). Price includes 8 (eight) Donkey ornaments.